An inside view of the opportunities for change that led us to open an office in Northern California’s largest city, San Jose. When a civic group with more than a century of experience working in San Francisco expands to a new city, it's a very big deal. What led SPUR to open an office in San Jose? Since our founding as the San Francisco Housing Association in 1910, we have worked on regional issues. The organization’s first campaign was the passage of the California Tenement Housing Act, which was actually a change to state law, motivated by the need to improve housing conditions following the 1906 earthquake. SPUR assisted in the planning of BART and helped form the San Francisco Bay Conservation and Development Commission (BCDC). We were instrumental in establishing the Golden Gate National Recreation Area. We have been involved with the major decisions faced by the Metropolitan Transportation Commission (MTC) and the Association of Bay Area Governments (ABAG) over the years. Throughout our more recent history, SPUR has promoted compact growth patterns and transit-oriented investments at the regional level. Our work on sea level rise, water supply and food systems is fully regional. And our thinking about the Northern California megaregion expanded the boundaries of our work even further. Through all of this work, we have remained a San Francisco–based organization. We have resisted calls to get involved in local planning issues in other cities, feeling that we lacked the deep knowledge of local context that is necessary to make informed recommendations. But we often wondered if the day would come when we could develop a way to work in other cities throughout the Bay Area that would support SPUR’s urbanist agenda. Over the past few years, the SPUR board and staff have been involved in strategic-planning efforts to think through what our role in the region might be. Now, we have come to a major decision — to open a SPUR office in San Jose with the hope of also doing so in Oakland in the future. This decision reflects our perspective about how our century-old organization can become even more effective in the next 100 years. 1. 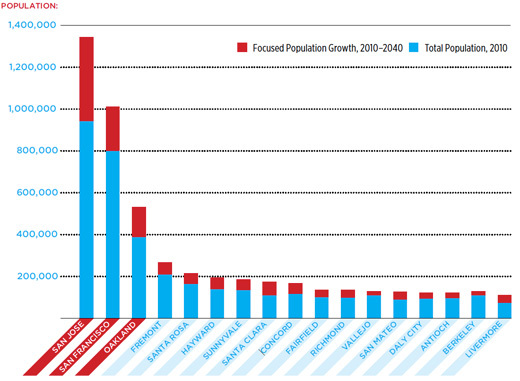 San Francisco contains a declining share of the region’s population. San Francisco represents just 11 percent of the Bay Area population, a gradual decline over recent decades. The same story holds true for jobs. Most of the growth in the Bay Area is happening in other parts of the region. Many of the big opportunities to promote the planning values SPUR cares about the most will take place elsewhere in the region. 2. Most regional decisions are actually made by local governments. Regional agencies (ABAG, MTC, BCDC, the Bay Area Air Quality Management District) have very limited purview and almost no authority regarding land use. The big region-shaping decisions — in particular the decisions about where and how to grow — are made by local governments. In order to influence the evolving shape of the region, what we need is the capacity to impact the decisions of cities. 3. SPUR’s core competency lies in urban policy. We know how to work at the city level. For decades, SPUR has been an organization rooted in San Francisco. We understand the complexities of neighborhood planning, political coalitions, public agency structure and varied policy issues from budgeting to transit planning. But we always think about the regional context for every local decision. For example, the way high-speed rail trains make their way through neighborhoods in San Jose and San Francisco is both a local issue and a statewide one and we approach it as such. Our niche is urban policy with a regional perspective. 4. The most important locations for forward-thinking urban policy are the region’s three largest cities — San Francisco, Oakland and San Jose. San Jose, San Francisco and Oakland represent 30 percent of the region’s current population and 34 percent of its current jobs. With the right investments, they could represent a growing share of the region’s population and jobs by 2040. As is clear from the charts on the following pages, these three cities are much larger than all the other cities in the Bay Area. They have well-developed infrastructure and the greatest capacity to accept growth. They have nuanced and involved local political and policy cultures. They have enough variety and scale for policy experimentation and enough similarities for important sharing among them. Based on these observations, we conclude that SPUR would be most effective by remaining an urban civic group but also expanding our focus to work with San Jose and Oakland. In short, we are arguing for a central city approach to regionalism. Getting these three cities to speak together with a strong voice will strengthen regionalism in the Bay Area as well as reinforce a Bay Area that is urban, dense, walkable, transit-connected and more economically competitive. We believe both Oakland and San Jose would benefit from an urban civic organization like SPUR, but because of a unique set of circumstances and opportunities, we are starting first in San Jose. In 2010, SPUR took its annual city trip to San Jose, where we were graciously hosted by the City of San Jose and the nonprofit 1stACT Silicon Valley, a San Jose–focused civic organization with widespread local partnerships. This was our first inside look into this city of 1 million people. 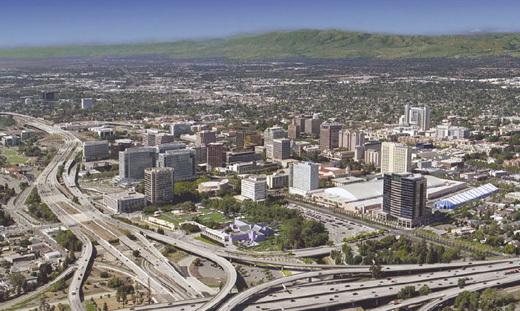 Based on our experiences,we published a series of articles in the August 2010 Urbanist about San Jose, its challenges and its potential to play a leading role in promoting smart growth. Contrasted against a dozen of the ninecounty Bay Area’s most populous — and most employing — municipalities, the charts above and below illustrate the significance of San Jose, San Francisco and Oakland as both the leading population centers and the cardinal employment hubs of the region. The three cities currently employ more than 34 percent of the region’s total workforce and are expected to accommodate the addition of 2 million new residents by 2040. 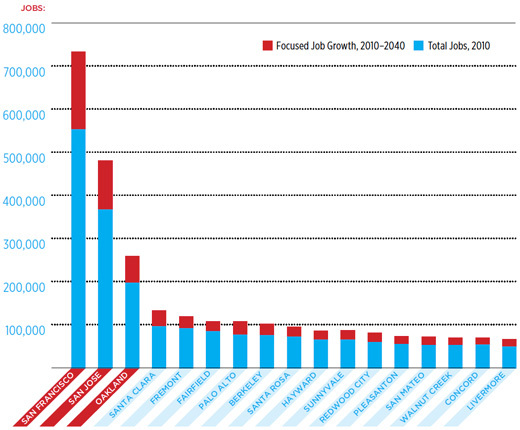 Source: Association of Bay Area Governments Projections are based on ABAG’s “Focused Growth” scenario. From the strength of the relationships forged on that city trip, 1stACT Silicon Valley and SPUR began discussing the possibility of SPUR working in the South Bay. Through hundreds of interviews and conversations with leaders in the community, we learned a great deal about the issues and opportunities there, and we were extremely gratified by the positive reception to the idea of SPUR working in San Jose. San Jose is a forward-looking city that is un-afraid of change. The civic leaders we spoke with are excited about SPUR’s expertise in place-making, its knowledge of best practices in planning from other cities and its evidence-based approach to urban policy. There are of course many civic organizations in the South Bay that have their own viewpoints, core competencies and vision to encourage positive change in the city and region. They bring an amazing energy and knowledge and are the civic leaders of one of the most important centers of economic innovation on the planet. We hope to play a supporting role with these allies where they are already actively engaged in great work by contributing our own expertise in urban policy in a way that brings something new to the table. > the benefits of nurturing an active, well-informed citizenry. The initial funders of SPUR’s regional program have been the Wallace Alexander Gerbode Foundation and the Clarence E. Heller Foundation. Their multi-year grant laid the foundation for this effort. Our first strategic partner for the San Jose project is 1stAct Silicon Valley. Connie Martinez, 1st Act’s executive director, along with the 1stAct board, helped up strategize and are making a significant investment of their own to bring SPUR to San Jose. The lead funders in this effort are the John S. and James L. Knight Foundation, the David and Lucile Packard Foundation and Jim and Becky Morgan. In addition, the William and Flora Hewlett Foundation provided a strategic planning grant to help us think through our communications and public engagement strategy. It is because of these strategic partnerships that we are able to start this initiative in San Jose. We will be looking for similar relationships in order to move forward in Oakland. In the coming months, we will continue our outreach into the San Jose community and will be bringing our efforts into focus. 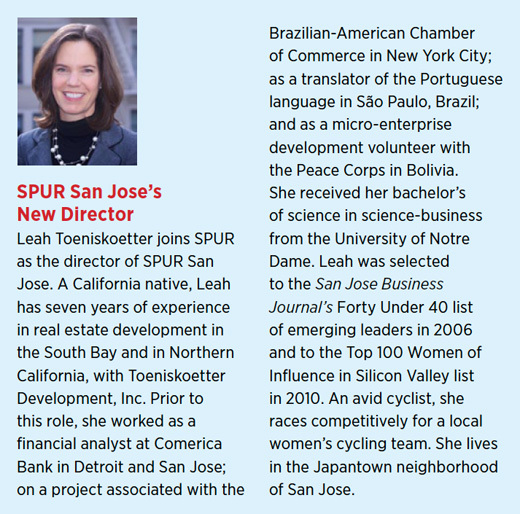 The director of SPUR San Jose, Leah Toeniskoetter, will be closely integrated into the SPUR staff so that we can operate as a single organization. We will form a San Jose advisory board with key local leaders and members from the SPUR board. We will work in the South Bay to raise the remaining funds needed for this three-year pilot project and hopefully beyond. Our goal is to effect positive change in a way that is guided and embraced by San Jose’s unique culture and outlook. As we enter into this expansion, we know we have a lot to learn about San Jose and a lot to learn about ourselves as our organization grows and changes. We look forward to engaging current and new SPUR members, citizens and stakeholders throughout the Bay Area to help shape the growth of our cities and our region. See Gabriel Metcalf and Egon Terplan, “The Northern California Megaregion,” The Urbanist (November/December 2007), spur.org/publications/library/article/mappingthenortherncaliforniamegaregion11012007. Special thanks to the Wallace Alexander Gerbode Foundation, the Clarence E. Heller Foundation, 1stAct Silicon Valley, John S. and James L. Knight Foundation, the David and Lucile Packard Foundation, Jim and Becky Morgan, and the William Flora Hewlett Foundation for their support.